That’s how I feel today, inundated! It seems to have started last Friday, all of a sudden I am getting phone calls and e-mails from all sorts of people concerning my move to the Pacific Northwest (PNW)! There are all sorts of different people arranging my corporate housing, scheduling the transportation of my car, mortgage brokers calling about pre-qualifying me for loans for home purchase, etc. Plus, I have loads of documents to read and sign and scan and return regarding all sorts of things ranging from direct deposit forms to relocation reimbursement forms to documents concerning selling my home in N.C. Lots of stuff! Plus, my mother’s birthday is coming up and I need to get her something and ship it to Ireland before I leave or God knows when I will get around to that and if it arrives late I will never hear the end of it! Earlier today I headed over to the outplacement office to print all of the above documents out. I assume I will be returning there tomorrow to scan and e-mail it all back! In regards to the car, I was told that I have to take absolutely everything out of it which was a disappointment as I was actually hoping I could put some unbreakable stuff in it as a means of getting some of my things out to the PNW rather than having to pack them in a suitcase. One good thing, though, is that while I was clearing out the inside of the car a little while ago I found my missing iPod Touch! I had misplaced it right before Christmas and as I have gone through virtually every inch of this house over the last few months sorting and cleaning, etc., I was convinced that I left it at the hair salon and that someone had gone off with it! It never showed up on “Find my iPod” so I figured they just threw it away as they couldn’t crack the security code I have on it. Well, today I found it stuck down tight between the driver’s seat and the center console of the car! YEAH!!! 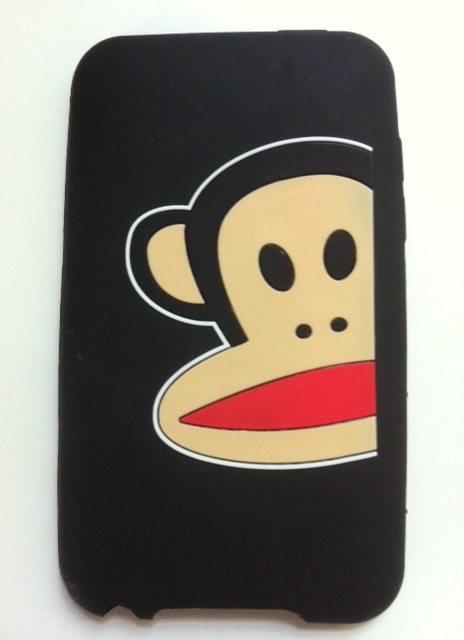 I am particularly excited as it has the cutest Paul Frank monkey case that I regretted losing! Of course, the people at outplacement all wanted to catch up on the status of my move and two of my cousins have called in the last two days wondering if we can do lunch or dinner or something before I go. It is a bit overwhelming as the days start to run out! I am good under crisis, though, so am pacing myself out as best I can and telling people that trying to schedule lunch and dinner are just more ‘to-dos’ on my list right now so I can’t deal with that until I have everything else under control. It may have to wait until one of my return trips when all my stuff is actually moved, etc. I still need to get a realtor selected and get the house on the market, that’s my priority right now! Hence, my little drink respite is now over and I must be off! This entry was posted in Outplacement and tagged outplacement, relocation. Bookmark the permalink.